We’re very excited to have been invited to play with mighty pop heroes Saint Etienne for their North East Christmas Show, in Hall One at Sage Gateshead on 8th December 2015. Posted 2015-11-16 by admin & filed under gigs. Get Tickets here – First 100 tickets receive free exclusive CD EP on the night! Warm Digits, the kaleidoscopic power duo whose music stretches out wide from krautrock and electronic disco through to guitar noise and free jazz, settle in for a one-night-only AV collaboration with analogue film collective Filmbee. Warm Digits are edging towards a third album, with new material sharpening their pop sensibilities while also going for full-on sonic extremes. They’ve picked up nods of approval from everyone from Andrew Weatherall to a full deck of BBC 6Music DJs, not to mention anyone who has seen one of their celebrated full-tilt live shows. Meanwhile Mat Fleming and Deborah Bower, with other members of Filmbee, will perform a special film and light show as a collaboration with Warm Digits. Turning up the light’s volume using 16mm projectors, slide projectors and other live visual effects, Film Bee, the third member of Warm Digits for the night, will blow minds and retinas with colour, flicker, abstraction and whatever they turn their cameras towards. 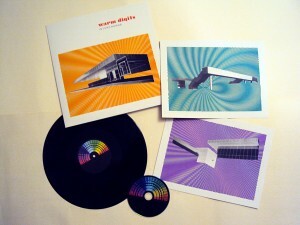 A limited CD-R from Warm Digits will be available to the first 100 ticket holders. It features first airings for three songs from the sessions for our next album, two of which are outtakes, unlikely to be released again. The electronic solo project of Dawn Bothwell features sedate, layered, euphoric tape mixes and harmonies. Flitting between Ghost Box ambience, lo-fi groove and subdued alt-pop. Posted 2015-10-08 by admin & filed under gigs. Our next gig sees us on the bill with James Holden at Sage Gateshead on April 28th 2015. James Holden plays a fine brand of stone-circle electronica, and we’re on the bill too, playing amongst other things some goodies from our nearly-finished-now-honest third album. You should come! Posted 2015-03-30 by admin & filed under gigs. Warm Digits play a special one off event this Friday 29th August at the Great Hall of Newcastle’s Discovery Museum – a screening of Ridley Scott’s Blade Runner, bookended by two special Warm Digits performances. Doors open at 7.30pm and the event starts with a unique short set of new Warm Digits material inspired by Vangelis, the composer of Blade Runner’s soundtrack. This will be followed by a full screening of the movie, following which we’ll play a further Digits set to round off the party. The event – now sold out! – is organised by Screenage Kicks, who put together widescreen immersive pop up cinema events in the North. If you’re looking for stage times, try checking the event Facebook page nearer the time. Our Vangelis set takes as its starting point his great and bizarre 1976 album La Fête Sauvage, taking flute and percussion samples and building two new semi-improvised pieces from them, followed by a cover version of the title track. Posted 2014-08-26 by admin & filed under gigs. Posted 2014-04-26 by admin & filed under gigs. Warm Digits started the new year with a brand new live session for BBC 6Music‘s Marc Riley. You can listen again to the session here – we appear at 45min and 1h 16min, playing live versions of “The Connected Coast” (from “Interchange“) and a new song called “End Times”. We recorded a third track – another newie, called “Wireless World” – for Gideon Coe’s show, which you can hear right at the end of his show (2h 51m). Posted 2014-01-04 by admin & filed under general business. We’re proud to be playing support to the legendary and fabulous ESG at Newcastle Think Tank on Monday 20 Jan. Details here, tickets here. Posted 2014-01-04 by admin & filed under Uncategorized. You get the album on 180g vinyl, a hand-screenprinted sleeve by Sam Grant at Blank Studios, with two additional prints as inserts (adapted stills from the films), a dvd of the experimental film for “Interchange”, a download code – and it’s all limited to 250 copies. Available right now for mail order. Posted 2013-07-24 by admin & filed under releases. DJ SETS FROM YOUNG LIAR, SECOND PRIZE, LIFE MECHANICS & THE GREAT NORTHERN DJS! 100 limited ‘early bird’ tickets are available for ONLY £5 The Cluny, RPM, Beatdown Records, and here: http://www.seetickets.com/event/warm-digits/the-cluny/725824 . Next 100 tickets are £6 each; Remaining tickets/on the door £7. 1pm – 7pm. Erm… FREE ENTRY! Posted 2013-07-22 by admin & filed under Uncategorized. Posted 2013-06-29 by admin & filed under gigs.